Each spring the geisha community of Gion in Kyoto puts on a spectacular dance known as the Miyako Odori. Shows are held several times a day throughout April at the Gion Kobu Kaburenjo. Timed to coincide with the arrival of spring, the ceremony is an absolute must see! Senior geishas play their shamisen at the side stages and young geishas act the play of the year. There are eight scenes and two to five geishas act in a scene. In the final scene, all geishas, twenty or more, dance on the stage. It’s amazing. The dance originated in the Meiji period, not long after Kyoto was supplanted by Tokyo as the nation’s capital. The city decided to stage an exhibition to showcase its elegant culture that had developed over its thousand year reign as the ancient capital. It was here in 1872 that the Miyako Odori was performed for the first time. A geisha is a professional entertainer specializing in traditional Japanese skills such as dance, singing, and playing traditional instruments. A geisha from Kyoto is known as a ‘geiko’, and an apprentice geiko is called ‘Maiko’. It is easy to tell the difference between geiko and maiko as their kimono, hairstyle and choice of shoe are very different. Maiko wear long, hanging belt to wrap kimono and hobble about in raised clog like shoes. Shows are performed 3 times daily from April 1st to 23th; they begin at 13:00, 14:45, 16:30 and last about 45 minutes. There are 2 classes of ticket, priced at Y4,600 and Y3,500. Special (Y4,600) class includes a cup of green tea and cake served before the show and you must arrive 50 minutes early. That is worth Y1,100 upgrading from the first class which does not have the tea service. Special and first class seats are on the first and second floors and chairs are available, while second class seating area is located on the third floor and only floor cushions are available. See http://www.miyako-odori.jp/kaburenjyo/ for the seating map. Tickets can be purchased through travel agents or by calling the reservation line on 075-541-3391 between 10:00 and 17:00. Alternatively, you can purchase your tickets on the day of the show. The theater, Gion Koubu Kaburenjo is only about 15 minutes walk from Kawaramachi station (Hankyu Railway) which is the very center in downtown. Perhaps you could combine this activity with ‘Sakura’ (cherry blossom) viewing in nearby Shirakawa and Takasegawa area alongside of canal. Also in eastern area, temples open for extended hours in the evening with special illuminations. See http://www.visitkansai.com/sightseeing/cherry-blossom-viewing/ for more information. 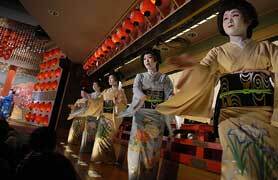 Miyako Odori is the most famous of the Geisha dances but there are also two others that run in April and one in May. Their theaters and number of Geikos are smaller than Miyako Odori. Tickets on the day of performances of Miyako Odori get quickly sold out at the box office, but other dances are available most of the time. Kyo Odori (above photo): The second largest show in Miyagawa district, about 10 minutes walk away from Miyako Odori. So you can take it as a second choice. 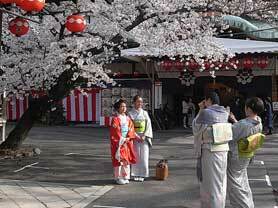 Kitano Odori : The theater Kamishichiken is close to the popular cherry blossom viewing spot, Hirano Shrine. Kamogawa Odori : Located in Ponto-cho, entertainment center with many restaurants and bars. Each locations are indicated on the map below.